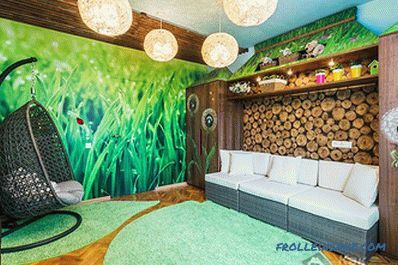 Nowadays, wallpaper in the interior of residential premises has become particularly popular, and their use for interior decoration may be of interest to both designers and home-lovers. 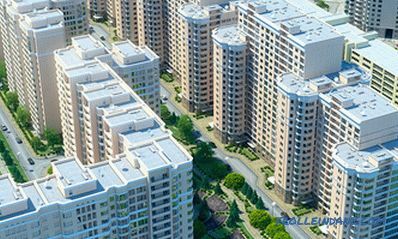 For this reason, this type of decoration of the walls of apartments and houses occupies a leading position. Unlike simple wallpapers, wallpapers are distinguished by a wide variety of subjects and themes, so they can be selected depending on the style of the room and its size. 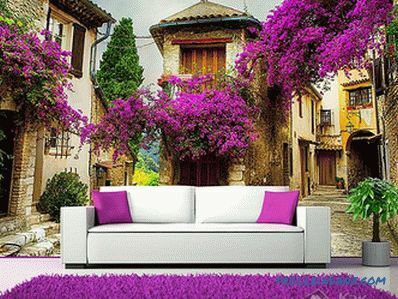 For interior design with color images, the most open and free wall of furniture is used. 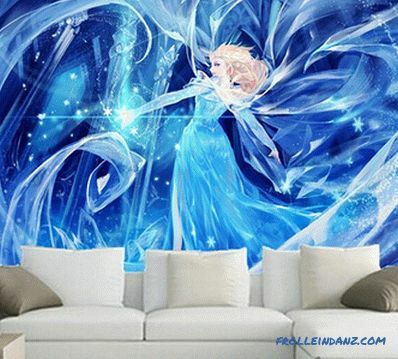 It is not recommended to stick all walls with photo wallpapers, as visually the room will become smaller. 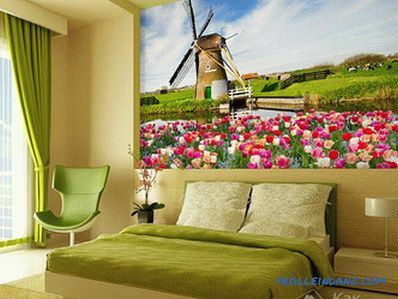 The advantage of modern photo wallpapers is that the decorative solution of the room is determined by the help; a bright and dynamic atmosphere is achieved. They are widely used in the interiors of small apartments, as this type of decoration not only decorates the wall, but also visually makes the space wider. 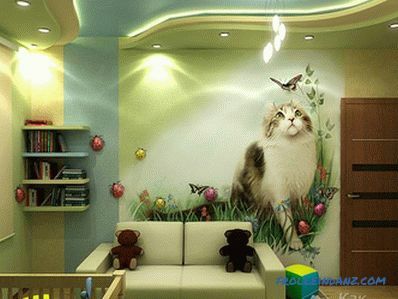 This way of wall decoration is relevant for a one-room apartment or a studio for zoning this room. Today, the industrial industry offers various options for images on photo wallpapers: night megalopolis , bright flowers, rural landscapes, a mysterious forest, a magnificent still life and much more. The interior of the room with photo wallpapers, depending on the selected pattern and color, influences the visual perception of the volume of the room, allows you to create a romantic and peaceful atmosphere, to tune in to the positive. By their texture, wallpapers are matte, glossy and structural. 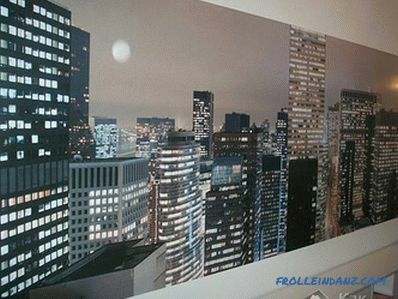 Matte photowall-paper is made of paper, non-woven, vinyl, they have high print quality, but are very fragile. They can not be washed, so they are best suited for living rooms, but not for the kitchen and hallway. Paper wallpapers are used to decorate the children's room, as they are harmless. 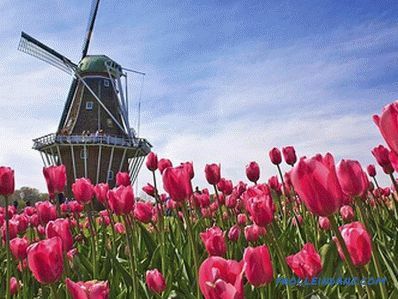 Glossy photo wallpapers in use are practical, can serve up to 15 years. They are not afraid of wet cleaning, so their use is permissible in the hallway and kitchen. Structural wallpapers are similar in texture to canvas, linen, decorative plaster, large sand. 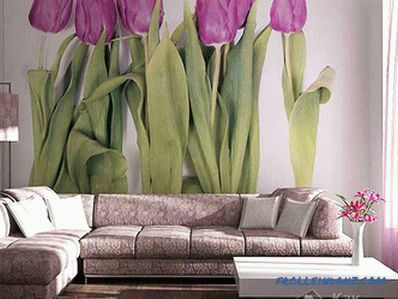 Because of their high cost and sophistication, this wallpaper is best suited for a living room or bedroom. Such wallpapers are high strength and quite beautiful. 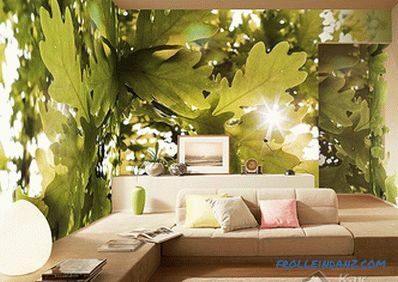 In addition, there are wallpapers that are additionally laminated, which makes them resistant to direct sunlight. The living room is the main room at home and therefore want to make it extraordinary. 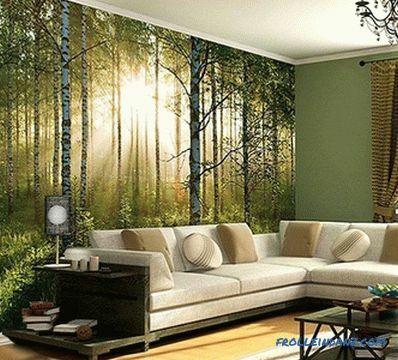 For the living room, the image on the wallpaper should be selected, given its overall style. It must be remembered that the wallpaper affects the mood and atmosphere of the room, so it is better not to use unusual intrusive images. Color can also affect the general perception - the interior becomes light or dark, warm or cold. 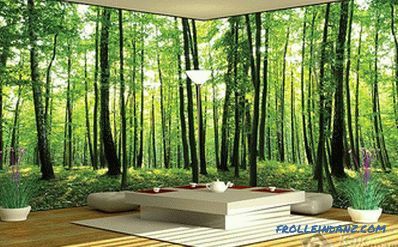 If the living room is not bright enough, then you can get out of the situation with the help of wallpaper with a sunny winter or summer landscape. For a classic style, images containing flowers and greenery would be appropriate. 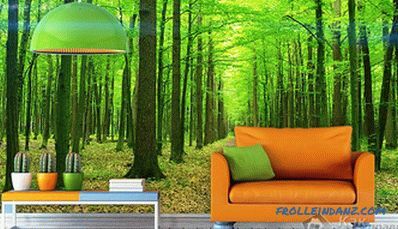 As you know, green shades have a beneficial effect on mood and human health, cause a feeling of peace and comfort. 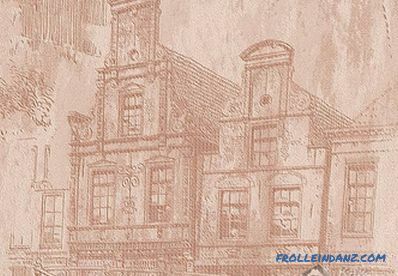 For the classics are perfectly suited wallpaper with a reproduction of a familiar picture. 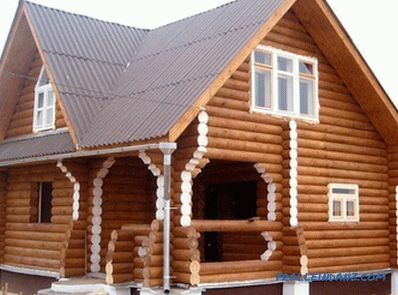 This will give the interior the spirit of luxury and antiquity. Black and white are ideal for a modern high-tech interior wallpaper with urban themes (city streets, squares). This style is characterized by the use of minimalist modern upholstered furniture, chrome lamps and accessories, glass tables and racks. 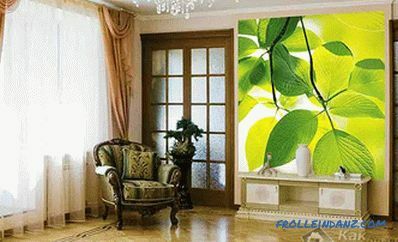 Bright wallpaper in the style of minimalism or high-tech will dominate in the design of the living room. Using wallpaper with the image of pop stars and movies, glamorous girls, best-selling heroes You can perfectly highlight the pop art style. 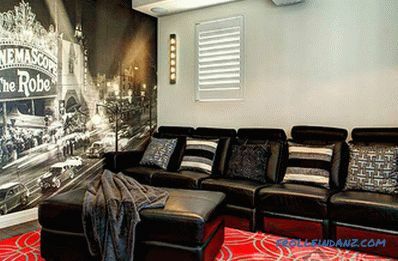 This room can be designed for youth parties and karaoke. Country-style living room is characterized by rustic motifs depicting fields, meadows, horses, mills. 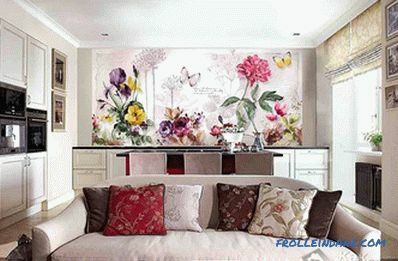 Wall murals containing such images will fit well into the interior of the living room of a country house. 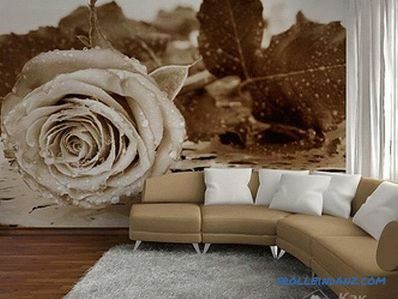 The products with the image of flowers are very popular.For example, roses can decorate the living room in a classic style, and in modern minimalism. It should be remembered that the interior elements should not cover the image on the wall. Shelves and racks can be used elsewhere. In the extreme case, choose a wallpaper smaller format. 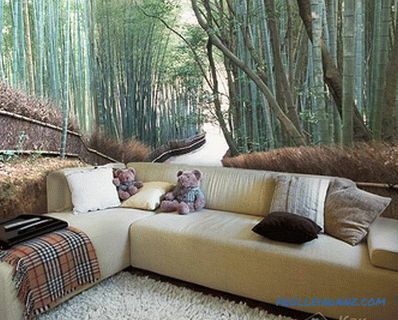 Photo wallpaper in the living room is best placed in a recreation area. 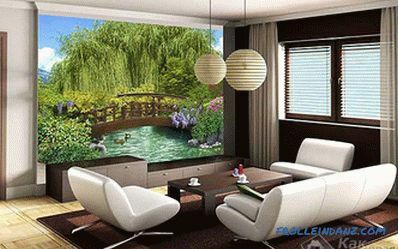 Upholstered furniture is better to put next to the wall decorated with such wallpaper, and cabinet furniture located opposite to admire the beautiful view. 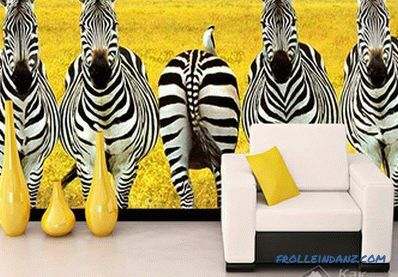 You can hang the TV on the wall, but only if there is an abstract pattern or background part of the photo wallpaper under it, otherwise you can lose part of the picture, and the TV on that wall will look ridiculous. To maximize the potential of the image, you can beat it in interior design. 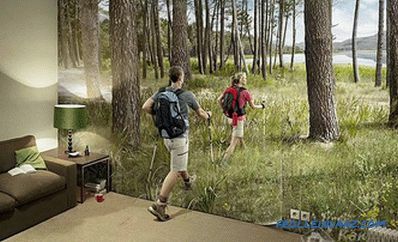 To do this, you need to supplement the interior with objects depicted on the wallpaper, so that they become real. 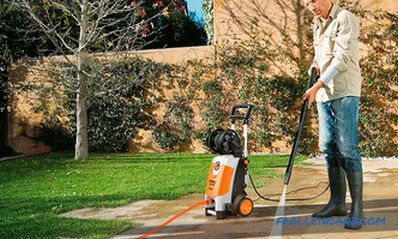 This method will visually expand the space and reveal the prospects. 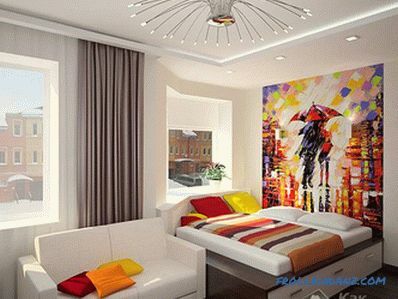 In the bedroom design should to be moderated, because bedroom - is a place of rest, a relaxation area. You need to consciously avoid super-bright neon colors that can disturb the cozy atmosphere. The most successful solution for the bedroom will be wallpaper with a romantic accent, large garden flowers and branches of flowering trees. Often in the design of bedrooms using sea scenes, reminiscent of a vacation by the sea. 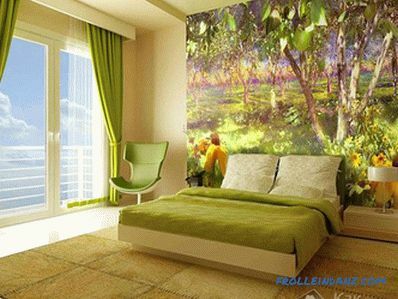 Also for the design of the bedroom they use natural themes - flowers, trees, mountains, and perspective or panoramic photo wallpapers. Such options are especially suitable for a small bedroom. If the composition is located opposite the entrance to the bedroom, then the indoor space will seem endless. First in the bedroom you need to define a free wall for gluing or its solid part, and then select wallpaper for it. In terms of the size of wallpaper, you need to thoroughly think about the interior so that the size is sufficient - not too small and not too huge. Otherwise, you can not get the result that was expected. Classic lovers should remember that it is necessary to combine tradition and modernity with large caution. For example, a strict and formal bedroom can be made more tender by decorating with wall-paper with the image of a bouquet or a sprig of orchids. 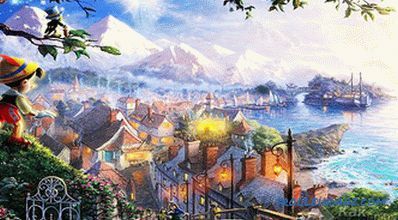 For this style of graphics or cityscapes are inappropriate. 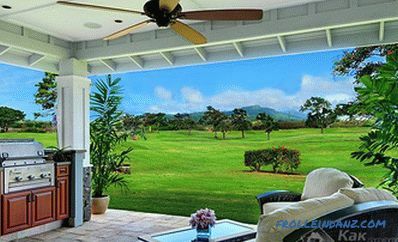 For a conservative retro-style, a small photo pan will suffice, and panoramic wallpapers will fit well into the design of the traditional style. People who like bright, expressive people will like wallpapers with unusual and original images For example, a macro photograph of a bright flower bud with dew drops. Modern design style blends beautifully with geometric or abstract images, as well as with a black and white portrait or landscape. When choosing wallpaper, you need to adhere to the main rule - do not mix styles and colors, as this will not give the bedroom the expected coziness. 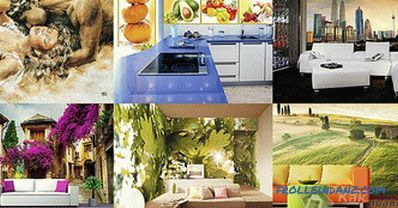 For a room like a kitchen where there are temperature fluctuations and high humidity, it is not easy to choose the right wallpaper, but you need to try, how they can be used to drastically change the interior. For a kitchen, it is better to choose samples on a non-woven base - although they are more expensive, but much better than paper ones and ideally fit to the wall. 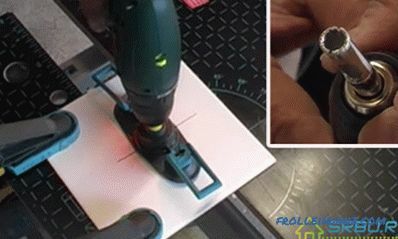 They can easily fit to each other, and the glue they almost do not swell. If among the samples on a non-woven base it was not possible to select the desired plot, in this case you can purchase thick paper wallpapers with a water-repellent coating. It is important to determine the size and location of the wallpaper. 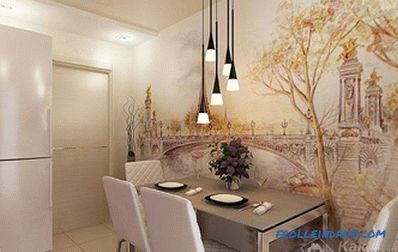 In a small kitchen it is undesirable to completely glue one of the walls with photo wallpapers, as this will make the room narrower. 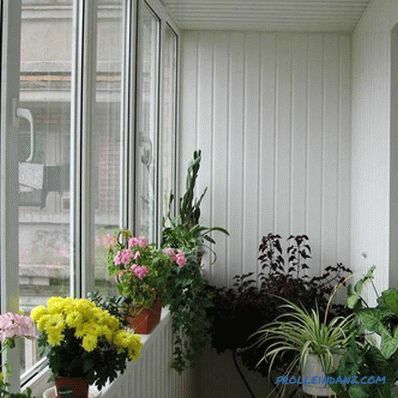 In such a kitchen, it is advisable to use photo windows on the walls or small panels. 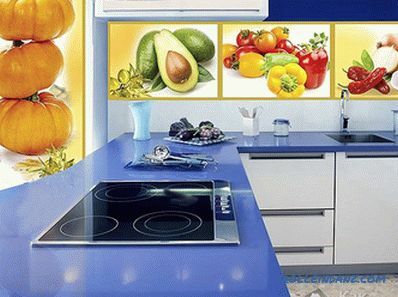 In the kitchen, wall-paper with the appropriate room, for example, falling, will look advantageous juicy lemon slice into the water, colorful still life, orange-berry collage. For the decoration of the kitchen, decorated in monochrome shades or black and white, the use of bright accents is appropriate. 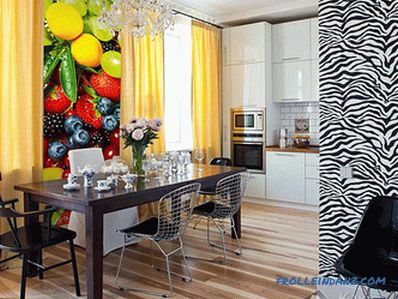 For the interior of the kitchen saturated colors are suitable black and white images. 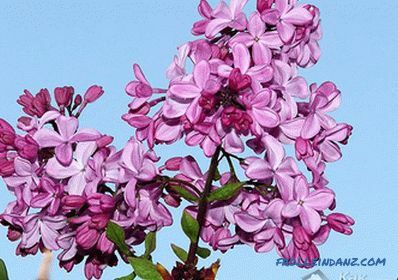 Cold shades of blue, green, lilac can make a small room more spacious.A beautiful combination of such shades may look something like this - against the blue sky a graceful lilac flower. 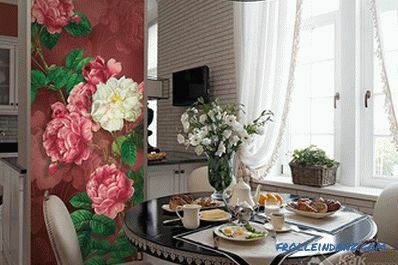 For close decoration Kitchen can use panoramic wallpaper on the whole wall. Especially attractive is the background image of a blue sky or sea. In a small space, it is important to respect the harmony of color, that is, the shades of furniture and photo wallpaper should fit together. Regardless of the size of the room, it is best to use natural paints. 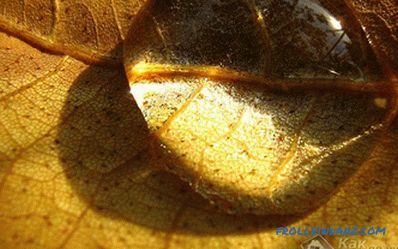 It is necessary to avoid sharp contrasts, acidic shades, annoying eyes and badly affecting mood in every way. Thus, with the help of photo wallpaper, any kitchen, even an unremarkable one, can be made into an original and cozy corner. 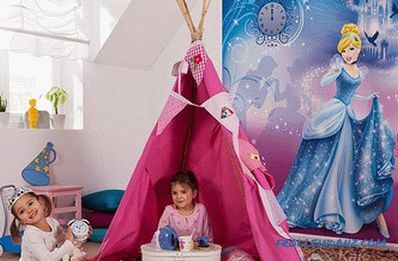 Children's room is a whole world for a child, where it grows and develops. Therefore, the design of the children's room should be done, taking into account, first of all, the child's preferences, and not fashion trends. Making the interior, you need to create conditions for the child, where he could have an interesting and entertaining time. 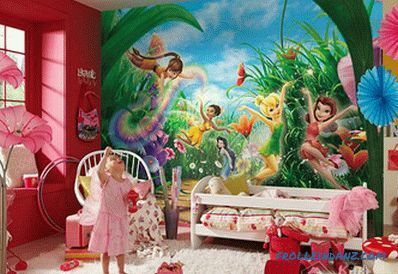 Kids especially like funny and colorful pictures, so photo wallpapers in the children's room are the best solution in choosing finishing materials. It should be noted that each age has its own characteristics. To finish the bedroom of a child under three years old, you can use wallpapers with small drawings that include primary colors. The image may be simple and clear figures, trees or flowers. Children from the age of three will understand the compositions depicting heroes of famous cartoons or funny ones animals. A child of seven years old may already have their own wishes. 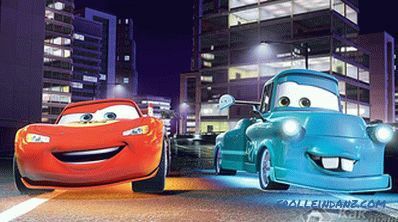 So, girls at this age prefer wallpapers with the image of princesses or delicate flowers, and boys can choose the plot from the cartoon "Cars" or ships and cars. Kids of this age group like pictures of animals, which is why it's very useful in a child's room Wallpapers with fluffy kittens, cute puppies, graceful horses. In this case, the animals in the photo should not be angry or aggressive. For the room of the little lady you can buy light furniture and light curtains, and for the boy's room to order a bed-car. It is best to place wallpapers in the gaming zone. In the design of the nursery, moderation is needed, therefore, as in other rooms, it is not necessary to glue the entire room with photo wallpapers, but only one of the walls, and even one panel will suffice. From the age of ten, children have difficult adolescence. At this time, the desire to change, so the fairy tales and toys are no longer relevant. You can choose the themes inherent in this age, for example, a soothing sea plot or a starry sky will have a beneficial effect on the mood of a teenager. When choosing a children's design, it is important to take into account the nature of the child, his interests and goals. 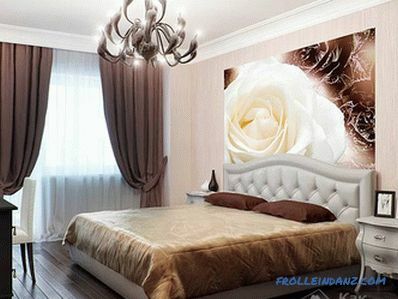 Photo wallpaper is the most effective decoration of the room. With their help, you can transform even the smallest and homely room, to divert attention from simple inexpensive furniture. To do this, you just need to choose the right canvas and the room will become stylish, like on the cover of a fashion magazine.